The Tree of Life is often drawn showing the branches reaching skyward and the roots spreading out into the earth below symbolising the Druid belief in the link between heaven and earth. Lotus Flower, or lily, has been a spiritual symbol in Eastern religion for thousands of years. The Rose is considered a symbol of balance. The beauty of this flower expresses promise, hope, and new beginnings. Due to the nature of this stone - Abalone - and the fact that the Bookmark contains natural Paua Shell, there will always be some difference between each piece as the colours of this stone vary across the spectrum of blues and greens. - BellaMira ships from London. 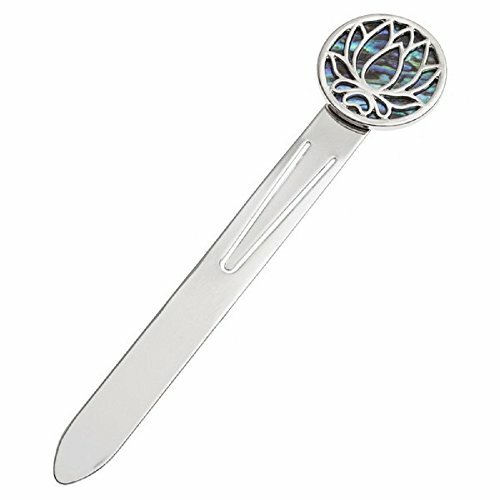 NATURAL ABALONE PAUA SHELL BOOKMARK / LETTER OPENER - Inlaid with Natural Abalone Shell, the bookmark features the iconic Tree of Life design, Celtic, Rose or Lotus designs, all plated with real Silver. The bookmark can also be used as a Letter Opener. TREE OF LIFE, LOTUS, ROSE SYMBOLISM: The Tree of Life can be thought of as your own Cosmic Family tree, telling ancient stories of your shared roots which link you to the past & your desires to reach for the Light. Lotus Flower, or lily symbolically represents being fully grounded in earth, yet aspiring towards the divine. The Rose is considered a symbol of balance and the beauty of this flower expresses promise, hope, and new beginnings. OCCASION: Gift for Men, Women Unisex as Father's Day, Mother's Day Birthday, Anniversary, Special Occasion or Office / Work Stationery. OUR GUARANTEE: Hypoallergenic Cadmium & Nickelt Free silver Plated Abalone Shell Jewellery responsibly sourced from New Zealand. 100% no-quibble money-back guarantee to ensure your satisfaction, your bookmark will be sent to you in an elegant BellaMira Gift Box. If you have any questions about this product by BellaMira, contact us by completing and submitting the form below. If you are looking for a specif part number, please include it with your message.